Here is a very informative video on story structure and plot points I found. Even though it concerns screenplays, the concepts are applicable to novels as well. 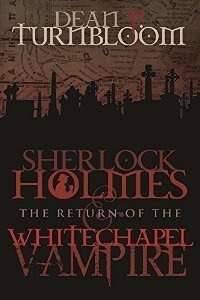 Sherlock Holmes & the Whitechapel Vampire by Dean P Turnbloom (MX Publishing, www.mxpublishing.com; £10.99/$18.95/€12.99) is robust pulp fiction, imaginatively identifying Jack the Ripper as an aristocratic Italian undead bloodsucker. Fact and invention are so mixed that it’s easiest to imagine all this happening in an alternative version of our history. The narrative rushes along, carrying you with it, in the best tradition of the thriller. And at the end (a good touch, this) Sherlock Holmes still doesn’t believe in vampires! I frequently hear from writers who are interested in a manuscript review or editing services, or who want to pitch an agent or publisher, and they tell me their book is 200 or 425 or howevermany pages long. When I’m feeling indulgent and patient, I’ll spend some time explaining why I don’t care how many pages their manuscript is – and why they shouldn’t, either. What counts is the number of words in the manuscript, because that’s how “long” the work actually is. Today, “page” means something so utterly removed from the typewriter days that it literally defies definition. And if we’re talking about e-books, those things don’t even have pages. As anyone who’s written (or graded) a high school or college term paper since the early 1990s can tell you, by tinkering with margins, fonts, line spacing – even leading, tracking, and kerning – an author can make a page whatever the author wants it to be. That’s not necessarily what everyone in the publishing industry accepts “a page” to be. The difference between what two well-intentioned people mean when they talk about “number of pages” can vary as much as 185%. Typefaces are an embarrassment of riches that cause a lot of embarrassment. Different word processors default to different fonts. You can choose among hundreds of fonts. 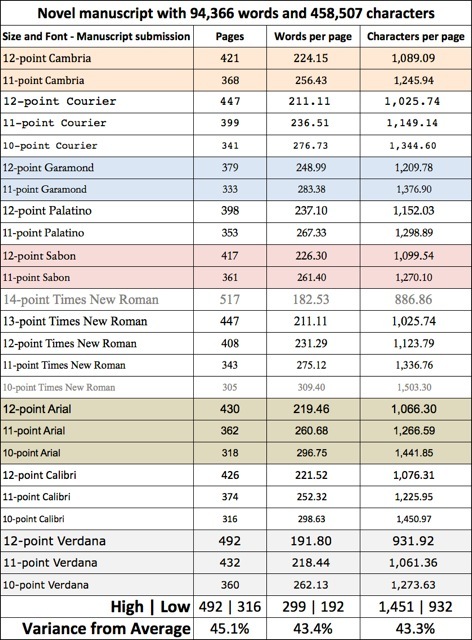 Fonts that are easy to read on a computer screen (sans serif fonts) are not as easy or comfortable to read on paper as serif fonts. Without changing anything in “how long” the manuscript is (same number of words, same page breaks for chapters, same headers), I altered the font and font size of the manuscript to show the impact of several popular fonts and font sizes on “how many pages” there are in the manuscript. The difference in number of pages based only on changing fonts and font sizes varied from 316 to 492 – a variance of 45% from the average number of pages in this spreadsheet. As for the rule of thumb about 250 words per page, the average words/page in this spreadsheet is 246.4 (not shown). Different, and common, fonts and font sizes can vary the number of pages in your manuscript as much as 43% around that average. 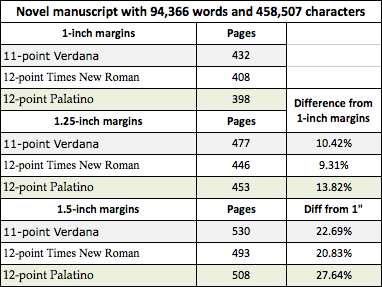 Without changing anything in “how long” the manuscript is, I altered margins from manuscript format (1 inch) to the defaults of various word processors (1.25 or 1.5 inches) to measure margin’s impact on number of pages. I also considered a few popular fonts that produce about the same number of pages in the formatted manuscript. The number of pages in the manuscript increases by an average of 11% if your word processor’s margins default to 1.25 inches, and by an average of 24% if your word processor’s margins default to 1.5 inches. Without changing anything in “how long” the manuscript is, I altered the formatting from traditional double-spaced lines and tabbed paragraphs to no formatting except paragraphs and tabs. Within the unformatted manuscripts, the average number of words on a page varies from 414 to 545 – which is to say, a lot more than 250. The middle section of this spreadsheet – the white rows – is most compelling. 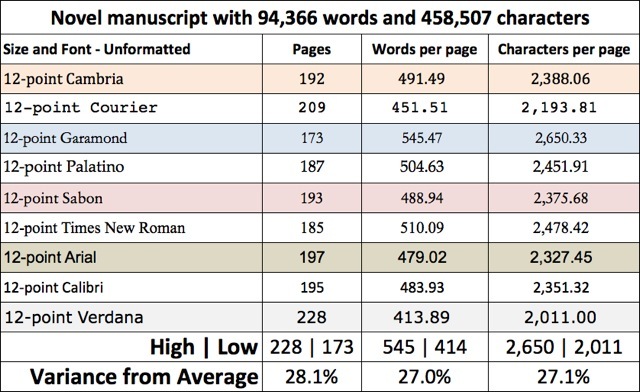 If we look at the average number of pages in a formatted manuscript, considering various fonts and font sizes, and compare it to the average number of pages in an unformatted manuscript, considering various fonts (but not different font sizes), there is a 100% difference in the number of pages. Two people talking about “how many pages” are in a manuscript may have a totally different interpretation of “how long” the manuscript really is. Focus on the number of words in your work, not the number of pages. The exception that proves this rule is that publishing pros – authors with multiple books and their agents, editors, and publishers – can shorthand “number of pages” because all of them operate on the industry-standard concept of a formatted manuscript. You can learn more about proper manuscript formatting from plenty of books and web sites. A friend who teaches fiction writing at a university refers his students to the web site of author William Shunn, which you can reach by clicking here. Challenges doesn’t even begin to tell it. I thought I would have a leg up, having had a book series published, but the world of fiction is so very much different. The first thing I tried to do after having the book written (although it’s gone through an evolution since this stage) was to try and interest an agent in representing the work. I learned a lot in this process, about the business of publishing as well as about writing. When I first began to fish for an agent, I had to decide what genre of fiction the work was. Was it a mystery? A detective novel? Horror? Paranormal? True Crime? Historical fiction? I honestly did not know. One of the big lessons I learned was that how I categorized it was a function of who I was trying to sell it to. Some agents only represent one or two genres. I went from one genre to another, writing well over a hundred queries, and being turned down well over a hundred times. But along the way, some of the agents were kind enough to offer bits of advice, which I tried my best to incorporate and I believe made my work a much better novel in the end. By this time, though, I’d run through so many agents that I was afraid I had poisoned the well, so to speak. So, I started looking for publishers who would deal directly with authors, which means smaller publishing houses. I was lucky enough to find MX Publishing, a smaller publishing house in the United Kingdom, that specializes in Sherlock Holmes book, and while my book was never meant to be a purely Sherlock Holmes book, the publishers liked it and agreed to publish it. The sequel, which is currently in the works, may be another challenge since Holmes will be absent. I hope I’ve learned enough to meet that challenge. Here I go again! I just learned that the paperback format of my book, Sherlock Holmes and the Whitechapel Vampire is selling in the top 3% of all the books sold on Amazon.com!! The Kindle version is selling in the top 13% in the KINDLE store! WOO HOO!!! Of course, I’m not sure how that’s calculated…but sure does sound good!!! The third and final section of the interview with Steve Emecz talks about something very near and dear to, the Sherlock Holmes pastiche. At about eight and a half minutes into this interview, Steve talks a bit about my book so I’m very excited about this one. Give it a view, won’t you? The second part of Steve Emecz’s interview concerns saving the home of Sir Arthur Conan Doyle, a most worthy cause. I encourage everyone to participate if possible.